Lake Worth offers a great quality of life in a friendly, mid-size coastal community. Exciting festivals, cultural diversity, and opportunities for home ownership in a variety of price ranges attract new residents daily. Opportunities for leisure activities are easily found. For golfers, the spectacular Lake Worth Municipal Golf Course features play along the scenic Intracoastal Waterway. A 19-acre public beach is open to the public from 6:00 a.m. to Midnight daily. The arts community has discovered and embraced Lake Worth. The Lake Worth Playhouse and numerous studios and galleries are highlights of any visit to the downtown corridor. Diners will discover a wide range of restaurants to suit every palate. From diverse ethnic specialties, international cuisine, small bistros and neighborhood pubs, Lake Worth has something for every taste. Distinctive stores offer an eclectic array of merchandise and one-of-a-kind items. 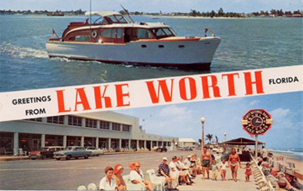 Lake Worth is proud of both its historic past and its dynamic future. New housing is becoming available throughout the City. Historic districts have been established to help preserve the old Florida architecture. City Hall is part of the Old Town National Register Historic District and the City Hall Annex is listed as a National Register landmark. But Lake Worth is also a city embracing change. Located in coastal central Palm Beach County, Lake Worth is easily accessible by road, rail, air and water. A large and diverse work force is available to support new business from light industrial to home occupations. In December 2004, the City annexed approximately 74 acres of property in the Park of Commerce. The purpose of the annexation was to increase the potential of employment within our municipal boundaries by increasing our capacity to accommodate heavy commercial and low to high traffic generating industrial uses. Education is strongly represented in Lake Worth. Four public elementary schools– all newly rebuilt or remodeled- and a middle school as well as private and parochial schools are located in the City and the surrounding area. Lake Worth High School, the premier public high school in Palm Beach County, continues a tradition of excellence spanning more than 65 years by boasting magnet and prototype programs that have won national recognition for excellence. Palm Beach State College is located two miles west of downtown while Florida Atlantic University is a 20-minute drive away. Both offer extended adult programs as well as full-time curricula. Visit Lake Worth and enjoy all the opportunities our residents enjoy every day. You might just decide Lake Worth would be a great place to live and work.